When is the last time you could do something really BIG with 15 bucks? Like, support an innovative independent publishing model AND get access to valuable resources to help you develop your creative career? You can’t remember, you say? Well lucky you, your opportunity is here! 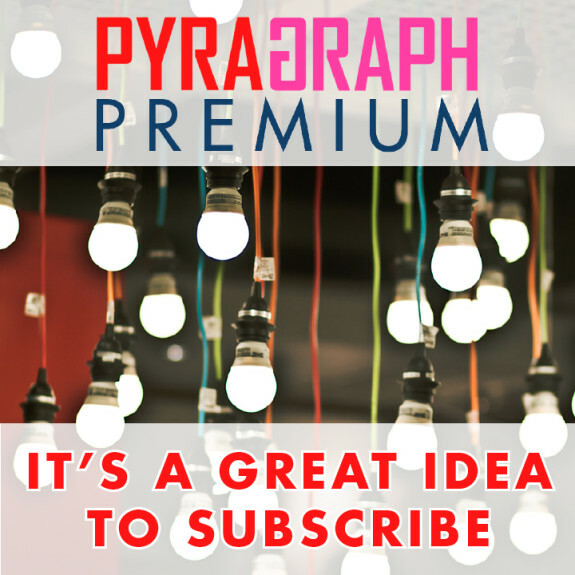 Pyragraph is now offering Premium subscriptions for just $15 a year. Subscribe now! Join us as a Premium Subscriber, and you’ll get access to to valuable tools and resources to help manage your creative projects and career. We have several Premium Resources available right now, ready for you to access as soon as you subscribe. New Premium Resources will be added every month, and we have some excellent tools already slated for January 2015. We are just getting started! Subscribe today and share with your extended family of creatives. Your subscription will build the foundation for Pyragraph’s growth! Assignment agreement for musicians and other artists to enter into deals with filmmakers, producers of commercials, or anyone who wants to purchase copyright to your works. Equipment tracking spreadsheet to track any equipment you buy like amps, guitars, a laser printer, pottery kiln, video camera, computer, and any other major purchase you buy for your creative work. Coming soon! Music Licensing 101 by intellectual property Rich Stim. More Premium Content added each month! Premium content including bonus videos and opportunities to call in to Pyragraph Office Hours will be added every month, starting in January 2015. To see all available Premium Resources, see our Resources page. Click here to subscribe now! Besides gaining access to these valuable resources, your paid subscription will help support Pyragraph and its innovative artist-centric publishing model. If you believe in the value of career advice for artists, by artists, a Pyragraph Premium subscription is a great way to support us.